The Puregear Slim Shell black case is designed for iPhone 4/4S Smartphone. This one-piece design com.. The Puregear Slim Shell blue/gray case is designed for iPhone 4/4S Smartphone. This one-piece design.. The Puregear Slim Shell blue/mint case is designed for iPhone 4/4S Smartphone. This one-piece design.. The Puregear Slim Shell dark pink/light pink case is designed for iPhone 4/4S Smartphone. This one-p.. The Puregear Slim Shell purple/blue case is designed for iPhone 4/4S Smartphone. This one-piece desi.. The Puregear Slim Shell purple/gray case is designed for iPhone 4/4S Smartphone. This one-piece desi.. The Puregear Slim Shell white case is designed for iPhone 4/4S Smartphone. 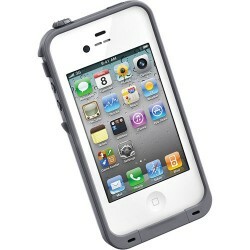 This one-piece design com..
LifeProof for iPhone 4/4s is the thinnest, lightest, strongest all-protective case ever created. And..
For all-day, take-anywhere protection, the pink Case for the iPhone 4/4s from Lifeproof makes a grea..
For all-day, take-anywhere protection, the purple Case for the iPhone 4/4s from Lifeproof makes a gr..
For all-day, take-anywhere protection, the teal Case for the iPhone 4/4s from Lifeproof makes a grea..